SpaceX Sells Ticket for a Trip Around the Moon; but Who’s the Traveler? It’s not your average vacation, but a well-heeled traveler has bought a round-trip ticket around the moon. Hawthorne-based aerospace company SpaceX says it plans at 6 p.m. Monday to identify the adventurous traveler, who will become the first person to travel to the moon since 1972, even though the trip won’t include an actual landing on the lunar surface. There was no immediate indication on when the historic flight might occur, nor on how much money the so-far unidentified traveler shelled out for the ticket. In February 2017, SpaceX announced that two “private citizens” had “paid a significant deposit” for a trip around the moon. It’s unclear if one of those people is the person who will be identified Monday as the planned moon traveler. 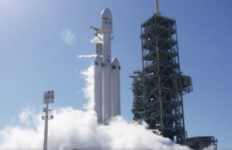 The company is still developing the BFR rocket, which will be the successor to SpaceX’s oft-used Falcon 9 rocket and its upgraded version, the Falcon Heavy. The BFR (Big Falcon Rocket) is being developed in a SpaceX facility at the Port of Los Angeles. SpaceX founder Elon Musk has said previously he hoped the rocket would be ready for a trip to Mars by 2022. The moon traveler would be carried around the moon in a SpaceX Crew Dragon spacecraft, which is also still in development. It is scheduled for an unmanned demonstration launch in November. The first manned flight is expected in April 2019 — a demonstration flight carrying two NASA astronauts. Following those demonstrations, the Crew Dragon is expected to be used to carry two more NASA astronauts to the International Space Station.